The universal symbol of the words I LOVE YOU. Send 3 Long Stem Pink Roses anywhere in the Philippines. Each order comes in an exclusive shipping box and greeting card. Exclusively provided by Island Rose Fresh Flowers! In general, pink roses symbolizes grace and gentility. The pink rose carries the message "you're gentle and graceful". Deep pink says "thank you". Light pink conveys admiration and sympathy. 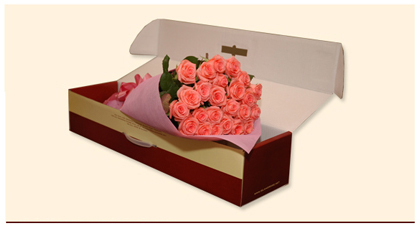 In this new era, pink roses can also be a symbol of a blossoming romance that would soon bloom into full passion. Pink roses can also be used to manifest joy and sweet affection, as well as wishing luck upon others. Send 3 Long Stem Pink Roses anywhere in the Philippines. Each order comes in an exclusive shipping box and greeting card. Exclusively provided by Island Rose Fresh Flowers!